*Staff arrives at camp at least one week prior to the campers for Staff Training. Many staff members will be asked to arrive earlier for specialized training and/or to help open camp. Some staff members may be asked to stay later to assist with closing camp for the winter. 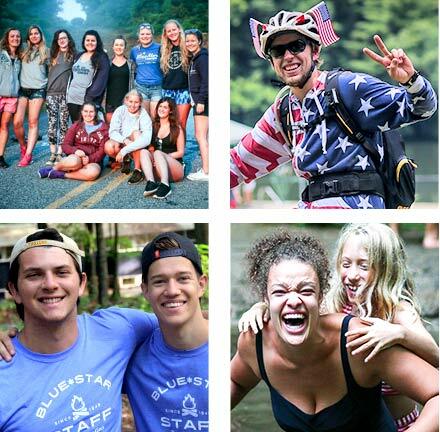 To work at Blue Star, you need to be a high school graduate or at least eighteen years of age. We prefer staff applicants who have at least completed their first year of university. For many of our activity specialist positions, we require that you are over the age of 21. When do the staff applications close? There is no deadline for the applications. The application is available until all of the positions are filled! How do I get to camp? Does Blue Star provide transportation? Staff have the option of driving to camp, and if desired may keep their cars at camp in the staff parking lot. Get driving directions to Blue Star here. You can also get to camp by bus or plane. We will provide transportation to and from two airports near camp: the Asheville Airport (AVL) in Asheville, North Carolina, and the Greenville-Spartanburg Airport (GSP) in Greenville, SOUTH CAROLINA. What if I am not Jewish? Blue Star respects all religions and welcomes people of all faiths. 75% of our counseling staff and 20% of our activity specialist/support staff are Jewish. It is our camp’s philosophy to encourage our campers to learn as much as they can about Jewish traditions and culture while making sure that people from all backgrounds feel comfortable at camp. We are not an extremely religious camp, but teaching the values of Judaism is a substantial part of our camping style. While you may be a minority at Blue Star, it is our experience that non-Jewish staff members are very comfortable with the level and type of Judaism we practice. When do I have time/days off? Your position and the area in which you work will determine your time off. All staff have time off each day and most staff have an entire day off each week. What should I pack for the summer? We recommend bringing clothes that you will be most comfortable in (shorts, t-shirts, sneakers, etc.). The days are hot during the summer, but it cools down in the evenings and rains frequently. You may also want to bring nicer clothing to wear for time off and evenings in town. Blue Star provides a pillow, linens, towels, and blankets, so you will not need to worry about bringing any of those items with you. What if I am a vegetarian or have diet restrictions? Blue Star is able to accommodate food allergies and vegetarian, vegan, gluten free and lactose-intolerant diets. If you have dietary concerns, please make arrangements with us prior to signing your contract.